It has been crazy cold in Atlanta for at least the past month, and I'm not even remotely ashamed to admit that a few weeks ago, it was so cold (in the teens all day, every day), that I didn't leave my house for almost a week. It's sounds ridiculous to say out loud, but it was freezing...literally. During the course of that time, I developed super dry lips. I was drinking water, wearing some sort of balm, and doing all of the "right" things, but my lips got to be so chapped, they physically hurt. I did a little research and discovered that if your lips are chapped, and you never rid them of the dry skin (ew), adding more and more balm isn't necessarily going to do anything. You have to remove the dry skin in order for them to heal. So, I whipped up a quick sugar scrub using ingredients I already had on hand. It kept for almost a week, and I used it every other day. I cannot tell you the immediate difference in my lips after just ONE use. 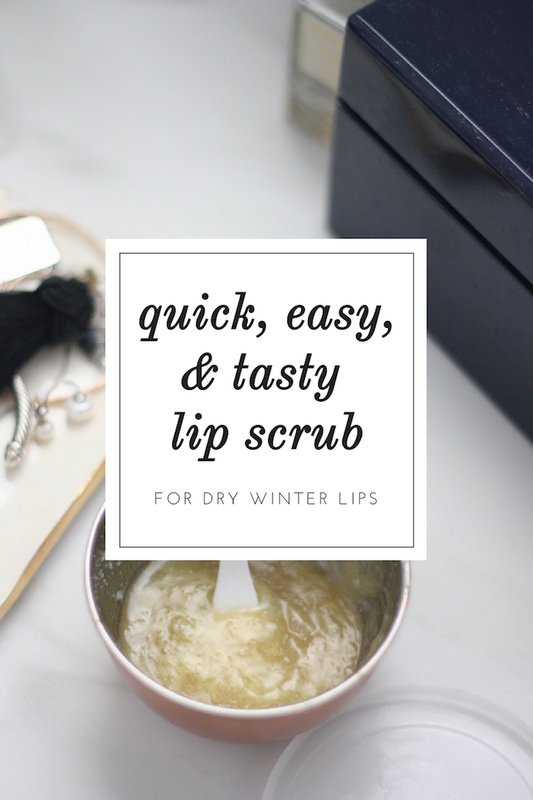 If you're having issues with dry lips, too, make a batch of this quick, easy, and tasty lip scrub. Warm or melt your coconut oil in a small bowl. Add honey and thoroughly mix. Add sugar and mix well to combine. Place in air-tight container. Gently massage dime-size amount onto lips, working slightly into skin until some of the sugar dissolves. Rinse with warm water. Immediately apply moisturizer, lip balm, or coconut oil to lips to lock in moisture. Note: If you have one handy, use a small paddle to get the scrub in and out of your container to avoid excess germs or contamination.